With the ReSound TV Streamer 2, you can enjoy watching TV with your family and friends again. ReSound TV Streamer 2 allows you to stream crystal-clear stereo sound from the television directly to your hearing aids from up to 22 feet away in clear line of sight. One of the first indications of hearing loss often occurs when watching television. People living with hearing loss often increase the volume, sometimes to a level that friends or family members find uncomfortable. What’s more, an increase of volume doesn’t always mean an increase in clarity. With the ReSound TV Streamer 2, you can enjoy watching TV with your family and friends again. ReSound TV Streamer 2 allows you stream crystal-clear stereo sound from the television straight to your hearing aids, which means you will be able to understand every word. Meanwhile, your friends and family can listen at a comfortable volume. The ReSound TV Streamer 2 turns your hearing aids into wireless headphones with a 22 foot range*. All ReSound Smart Hearing aids and TV models are compatible with the ReSound TV Streamer 2. It can be used for your stereo or computer as well. With its ease of use and versatility, the ReSound TV Streamer 2 will quickly become a vital part of your home entertainment system. You’ll wonder how you ever lived without it. 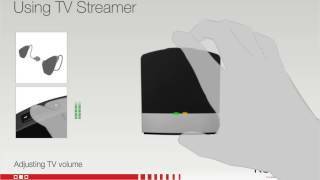 The ReSound TV Streamer 2 is easy to set up and use. The ReSound TV Streamer 2 is one part of the full ecosystem of wireless accessories and apps which enhance your ReSound Smart Hearing experience. With the ReSound Remote Control 2 or ReSound Control app, you can adjust both the volume of the TV and the volume of your hearing aids independently. If you have the ReSound Phone Clip+, a phone call will override the TV, so you can decide whether to answer or reject the call. 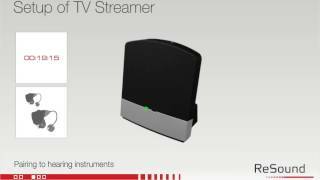 A hearing care professional can tell you more about the ReSound TV Streamer 2.